Have you ever played “I’m going on a picnic …”? One person starts the game by saying, “I’m going on a picnic and I’m bringing …” and that person finishes the sentence with a word beginning with the letter a. For example, “I’m going on a picnic and I’m bringing apples.” The next person has to repeat what the first person is bringing and add an item beginning with the letter b. “I’m going on a picnic and I’m bringing apples and bananas.” The next person repeats what the first and second items were and adds an item beginning with the letter c. The game continues with each person adding a new item throughout the alphabet. The goal of the game is to remember every item and if you’re unable to, you’re out. The Yankees’ injured list has become one frustrating game of “I’m going on a picnic …” and I’m having trouble remembering who’s on it and what for. The Yankees knew they were going to be without Didi Gregorius for at least half the season following offseason Tommy John surgery. So before the first pitch of 2019, the Yankees were aware they would be without their starting shortstop, best infield defender and middle-of-the-order left-handed bat. The Yankees’ injured list is Didi Gregorius. Even though the Yankees go into every season knowing CC Sabathia will eventually miss a few starts due to to his lingering knee issues, no one expected him to have to undergo a heart procedure. The procedure delayed his schedule and timing to be ready for the start of the season, so the Yankees would have to plan for one of their depth starters to make at least one start in Sabathia’s early-season absence. The Yankees’ injured list is Didi Gregorius and CC Sabathia. What seemed like minutes after he signed a four-year, $40 million extension, Luis Severino went to start a spring training game and complained of a shoulder issue. An MRI showed no structural damage, only inflammation, and he was shut down. The Yankees weren’t about to push their 25-year-old ace who they just extended, and it was announced Severino would miss at least the first month of the season. The Yankees’ injured list is Didi Gregorius, CC Sabathia and Luis Severino. Right after Severino went down, so too did Aaron Hicks — also a new member of the Yankees extension club after signing for seven years and $70 million. This injury was the least surprising of the group since Hicks has never played a full season in the majors despite approaching age 30, and while it wasn’t an oblique or hamstring injury this time, it was a back injury, which would cost him at least the first couple weeks of April. The Yankees’ injured list is Didi Gregorius, CC Sabathia, Luis Severino and Aaron Hicks. Dellin Betances began spring training late after the birth of his first child and was trying to play catchup through March. His fastball velocity was shockingly in the 80s and for someone who frequently reaches triple digits, it was a major red flag. Betances tried to play down the radar reads citing his history of gaining velocity as both the spring and season went on, but it wasn’t long until he would hit the injured list with a shoulder impingement, putting him on the shelf to begin the year. The Yankees’ injured list is Didi Gregorius, CC Sabathia, Luis Severino, Aaron Hicks and Dellin Betances. Early on Monday, news broke there would be another Yankee added to the injured list: Giancarlo Stanton. Stanton had swung out of his shoes, like always, on a 3-1 pitch on Sunday, fouling the ball straight back and then was seen flexing his arm and wincing a bit before continuing his at-bat. He initially thought it was a cramp, so he remained in the game, but it turned out to be a bicep strain, which will shut him down completely for the next 10 days. The Yankees’ injured list is Didi Gregorius, CC Sabathia, Luis Severino, Aaron Hicks, Dellin Betances and Giancarlo Stanton. The Yankees’ injured list is Didi Gregorius, CC Sabathia, Luis Severino, Aaron Hicks, Dellin Betances, Giancarlo Stanton and Miguel Andujar. When Gleyber Torres pulled off his glove on Monday night and began shaking his left hand, I immediately thought the worst. Torres had been unable to come with Gary Sanchez’s throw down to second and his glove hand had become part of the play. Torres remained on one knee for a brief moment as the Tri-state area held its collective breath. Would another Yankee really land on the injured list? Thankfully, no. Adding Torres to the list on the same day Stanton and Andujar landed on it would have been funny in the least funny way ever. It most likely would have made me cry, considering I was already on the verge of tears after the series loss to the Orioles coupled with the already lengthy and absurd list of injured Yankees. Right now, 28 percent of the Yankees’ would-be roster is on the injured list. Here is what they’re missing. Six of the seven injured Yankees are expected back at some point with Andujar’s status still unclear. On paper, the Yankees roster was the favorite to win the 2019 World Series, but that paper has now been spilled on, crumbled up and shredded. 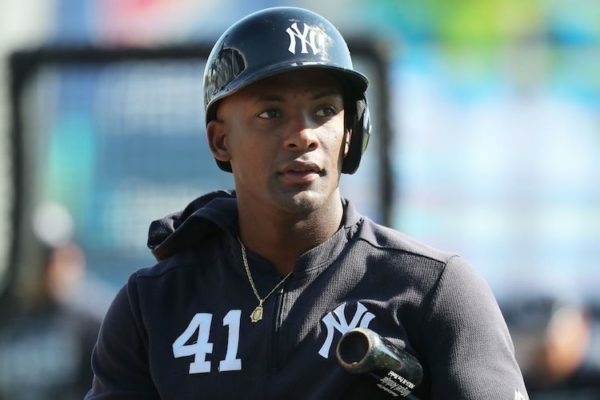 If Andujar doesn’t return it will mean the 2019 Yankees won’t play a single game at full strength. Fortunately, the Yankees have somewhat of enough depth to cover for these injuries for the time being though it’s impossible to fully cover for the production currently on the shelf. All the early-season off days help, and while no one wants any game to annoyingly be postponed, a few rainouts with rescheduled dates for later in the season would certainly be welcomed given the Yankees’ current situation. Injuries happen, and even if this amount is laughable, no one is going to feel sorry for the Yankees. For now, it’s up to a lineup closely resembling that of a spring training road trip to win games, and that means beating up on the American League’s worst even without your best.